CEPH-accredited schools and programs in public health provide the most rigorous and well respected educational experiences in the field. Search our comprehensive database to browse for an accredited school or program that fits your interests. Find an Academic Program What is CEPH Accreditation? A degree in public health allows students to concentrate in a variety of different academic and professional areas. Degrees in public health prepare graduates for the professional and academic challenges of the field, and equip them with the resources to solve and advance them. In addition to traditional in-person degree options, there are many schools and programs that offer nontraditional degree programs. These include certificate programs, online degree programs, executive programs, and summer institutes. The search for an academic program tool provides a complete list of options. The Bachelor of Science (BS) or a Bachelor of Arts (BA) in public health provides the introductory foundations for a future career in public health. While the degree is offered only at select public health schools and programs, it allows the undergraduate to receive early and broad training in the field in order to prepare for further study in public health. A BS, BA, and BSPH are not necessary prerequisites to apply for a graduate-level degree in public health. The Master of Public Health (MPH) degree is the most common graduate-level degree awarded by CEPH-accredited schools and programs of public health. The degree is suited for students interested in pursuing a professional career in public health, and is not primarily geared toward teaching or research. Common work environments include hospitals, consulting firms, international agencies, state and federal agencies, health departments, managed care organizations, community-based organizations, among others. Other masters degrees include Master of Health Administration (MHA) which prepares students for careers in hospital administration, health policy, and health service management. As well, Master of Science (MS) and Master of Health Sciences (MHS), are academic degrees oriented toward students wishing to seek a career in teaching or conducting research at a college or university or other settings. The Doctor of Philosophy (PhD) degree in public health is designed to prepare the student for a profession in teaching and research. PhDs and Doctor of Science (ScD) in public health continue their careers teaching at a university, conducting research in a national laboratory, or doing field work with populations across the globe. The Doctor of Public Health (DrPH) degree is an advanced graduate-level degree that focuses, like the MPH, on the professional and practical elements of the field, rather than the academic. Graduates with an MPH/MD can apply their clinical skills with a public health perspective. They may work in a traditional clinical setting or may work in a public health setting whether they can apply their medical knowledge to complex public health issues. Graduates with a MPH/JD degree focus on health policy and public health law. They often look at how federal and local laws and regulations impact the public’s health. Public health nurses comprise the largest sector of the public health workforce. Graduates with a combined MPH/MSN degree work on the front-line of public health managing public health interventions and public health programs. Graduates with an MPH/MBA combine their organizational management and leadership skills which are used in hospital settings, managing health care organizations and non-profits. An MPH dual degree with a Masters of Social Work is geared towards individuals interested in the intersection of social work in the health care system. Often courses are designed to teach students a preventative approach to health and social issues with an emphasis on underserved populations. Graduates with an MPH/PharmD dual degree are equipped to have special expertise in pharmacology, health promotion, disease prevention, and population health. Students will have advanced knowledge in the treatment of disease, medication safety, and pharmacotherapy. Students with an interest in Public Health and Physical Therapy can pursue a dual degree with an integrated approach to health care. Graduates are able to be more responsive to today’s health care needs by training physical therapists to be leaders in prevention, health promotion, and population health. The MPH degree can be combined with countless Master of Arts or Master of Science degrees, as well as Master in Public Policy and Master in Program Management. Common MPH/MA (MS) include International Development, Biomedical Studies, Latin American Studies, and Anthropology. ASPPH plays a leadership role in strengthening the capacity of the public health workforce through its management and support of several federally funded initiatives, including several centers funded by the CDC, including the Preparedness and Emergency Response Learning Centers, Preparedness and Emergency Response Research Centers, Prevention Research Centers, Education and Research Centers, as well as the HRSA-funded Public Health Training Centers. The Delta Omega Honors Society supports students and professionals of public health through a well-connected and highly respected community. Founded at Johns Hopkins University in 1924, Delta Omega has 80 chapters worldwide today comprising more than 15,000 members. Every year, Delta Omega inductees include top-achieving graduates and alumni of public health schools and programs. Through our fellowship and internship programs, ASPPH has cultivated the professional development of more than 2,200 early-career public health professionals over the past 30 years. These programs offer practice-based, mentored training experiences for students and recent graduates of ASPPH member, CEPH-accredited schools and programs of public health. The Certified in Public Health (CPH) credential allows graduates and professionals to continue their training in public health and ensure mastery in the competencies of the field. The CPH credential is voluntary for public health professionals and establishes expertise in the most current topics in the field. The CPH credentialing process comprises the CPH exam and a subsequent bi-annual recertification process. The National Board of Public Health Examiners is the independent organization tasked with administering the CPH exam and ensuring the programs and students remain credentialed and properly accredited. In Spring 2015, new pilot eligibility for professional experience in public health was announced. Individuals without an academic background in public health but who possess a Bachelor’s degree and at least five years’ work experience to sit for the Certified in Public Health (CPH) exam. The pilot will occur during the computer-based testing period of October 1-31, 2015. This is an important moment for public health, not only for employers who can begin to use the credential more broadly to select and reward employees, but also for individuals who can distinguish themselves as certified public health professionals. It also brings the field closer to the NBPHE mission of professionalizing public health. 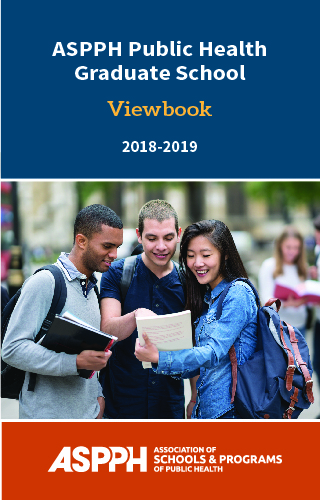 This Digital Viewbook provides an overview of each of our member institutions, including information such as programs offered, deadlines, enrollment terms, and unique program attributes. The Viewbook is a resource to help with your find the graduate program that’s right for you. We hope you’ll use this in addition to our Academic Program Finder and our member institutions’ websites.